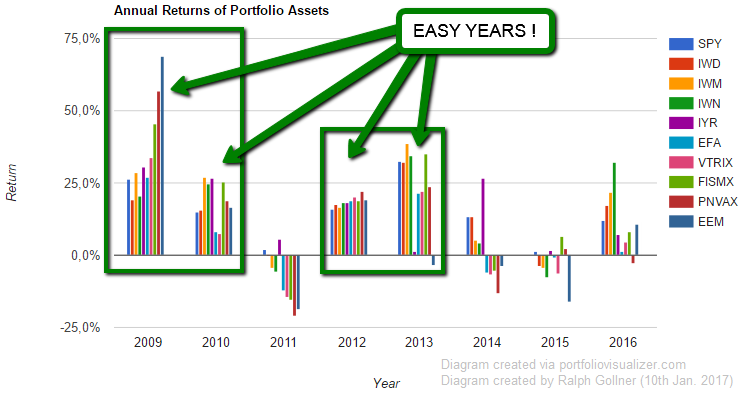 Hypothetical portfolio for illustrative purposes only ! 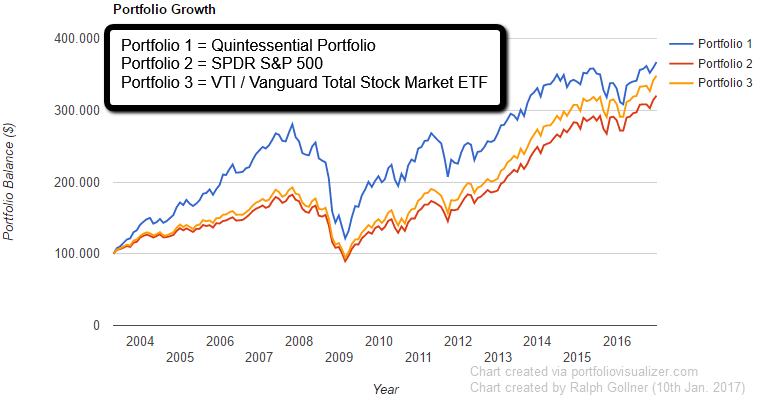 versus S&P 500 & Co.
No other fund is as efficiently managed or offers such broad diversification to the U.S. stock market. By investing in every U.S.-listed security in proportion to its market capitalization, the fund gets close to the ideal market portfolio. In recognition of the fund's success, the fund has grown to become the largest U.S. mutual fund available. With many actively managed funds, asset bloat can become a concern. But with this fund, it's less of a concern because the fund is able to pass on economies of scale, and it's able to track its index more efficiently. In fact, the fund charges just 5 basis points; that's USD 5 on every USD 10,000 invested. 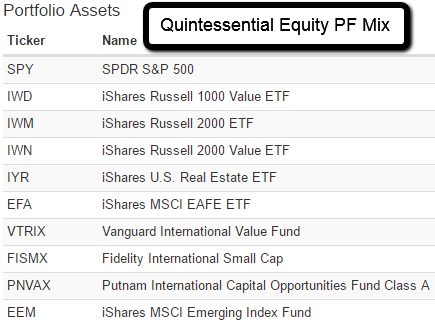 The fund offers both a mutual fund and an ETF share class, which are both available at 5 basis points. In order to get a feeling for the numbers, and no only the visual "effect", please find the pure figures below. Diversification didn't work during the last market crisis. This is certainly true, but it's not an argument for staying close to home. It's true that during the financial crisis about the only two asset classes that provided any real hedge were safe haven bonds, including Treasuries, and gold. Virtually all other risky assets moved in lockstep. 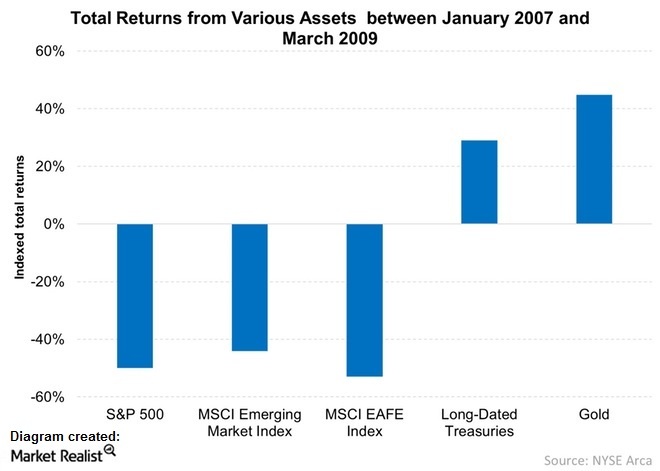 The graph above shows the total returns for various assets between January 2007 and March 2009. 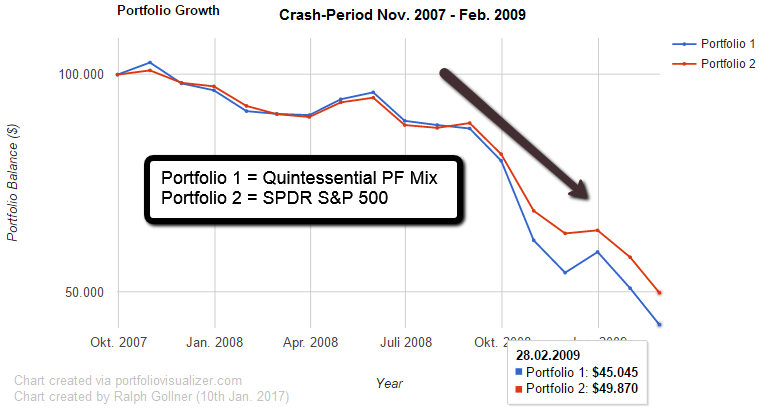 Risky assets, including equities, had a torrid time as investors were terrified by the financial crisis. This led to the so-called "flight to safety." The S&P 500 (SPY) dropped by 49.4% in that period. International stocks weren't spared either, with international indices moving in a lockstep with each other. The MSCI Emerging Market Index (EEM) dipped by 44.0%, while the MSCI EAFE Index (EFA), which tracks stocks from developed markets other than the United States and Canada, lost 52.9%. Meanwhile, safe havens like gold (GLD) and Treasuries, as tracked by the iShares Barclays 20+ Year Treasury Bonds ETF (TLT), gained traction as investors looked to park their funds in safe assets. Between January 2007 and March 2009, gold and Treasuries gave returns of 44.8% and 29.0%, respectively. Remember, though, that gold prices can be quite volatile. But it's considered safe because of its very low correlation with equities. Recap on the Years 1997 vs 1998: The Asian Crisis saw a rise in equity correlations globally looking back before the most recent crisis, we also saw high correlations during earlier periods of stress. For example, in the prelude to the Asian crisis in 1997, the U.S. equity market had a relatively low correlation, around 0.32, with non-U.S. stocks. That correlation jumped by more than 50% as the world focused on the turmoil in Asia. A similar phenomenon occurred a year later with the Russian default in 1998. The correlation between the United States and the rest of the world from January 1997 to July 2007 was 0.51. It increased to 0.67 during the crisis. The correlation between the S&P 500 and the Asian stocks was as low as 0.1 before the crisis. It increased to 0.55 during the crisis. This again proves that diversification with international stocks is not as effective during crises. It also underscores the POSSIBILITY (!) of adding to your portfolio safe havens like gold (IAU) and Treasuries (TLT) (IEF), which may/can provide protection during a (severe) crisis. Short Recap on the returns on the SPDR S&P 500 ETF Trust (SPY), the iShares MSCI Emerging Market ETF (EEM), and the iShares MSCI EAFE ETF (EFA) in the last ten years (up to the year 2015): SPY has returned 78.4%, while EEM did even better with returns of 85.2%. 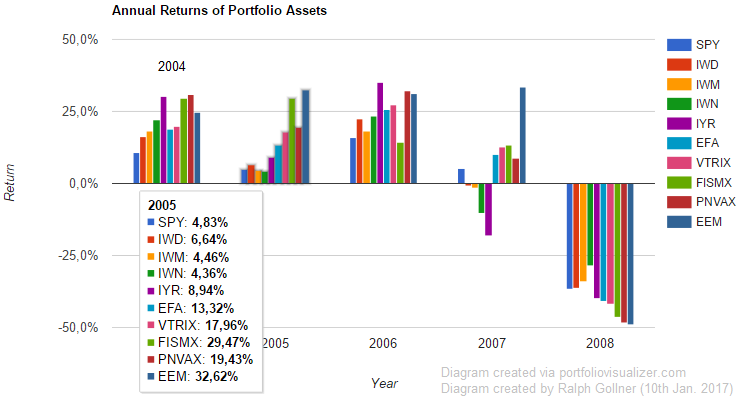 The EFA has underperformed with returns of 25.7% in the same period. If you had allocated your money equally toward these three ETFs, you would have gotten returns of 63.1%, which is a CAGR (compounded average growth rate) of ~5.0%. 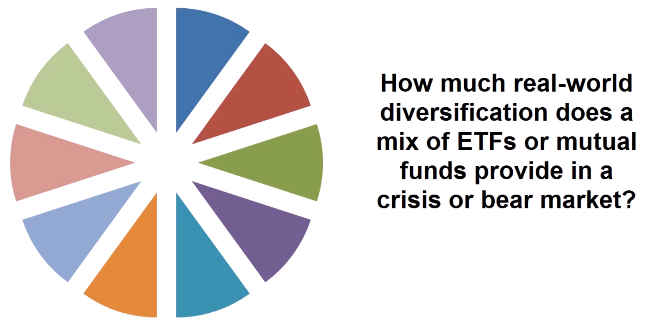 While diversification is less effective during a crisis, a diversified portfolio gives better risk-adjusted returns in the long term. Emerging markets (VWO) are quite volatile compared to US equities (IVV), but they have given better returns in the long run. Emerging market funds give you access to high growth and give the best returns in the long term rather than the short term, which would expose you to a lot of risk. So you shouldn't lose hope during crises. They actually give you an opportunity to buy your favorite stocks or ETFs at a bargain. According to the basic tenant of portfolio construction, a portfolio that is concentrated in just one market, even a large, diversified market such as the United States, will rarely produce the best long-term risk/reward trade-off. This is because such portfolios are taking on risk that could have been managed with diversification; a well-diversified, global portfolio can help minimize this unnecessary risk. 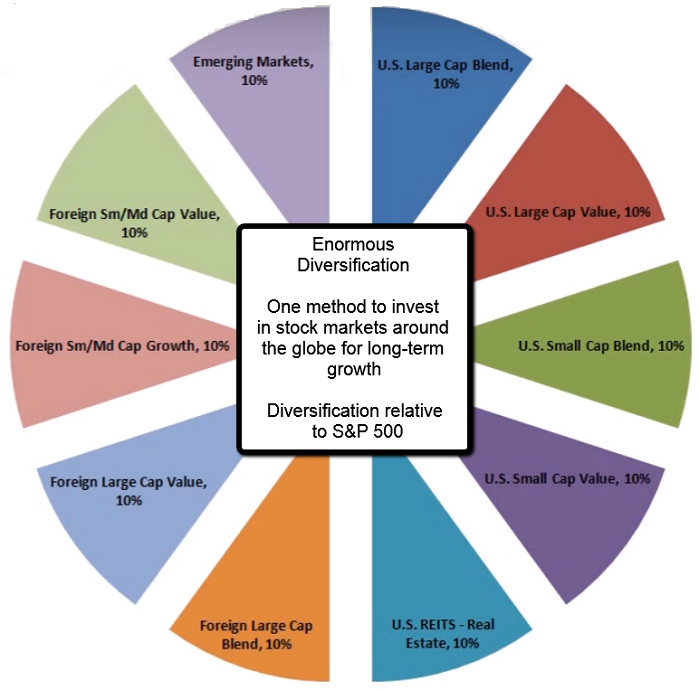 Indeed, while international diversification is a sensible idea for most U.S. investors, its benefits may be even more likely to accrue in the coming years, given that U.S. stocks are more expensive than their international counterparts and the United States' relative share of the global economy is declining.